Live acquisition of data from multiple providers, using customized connections tailored to the incoming data, including web-services, provider specific APIs, FTP, etc. 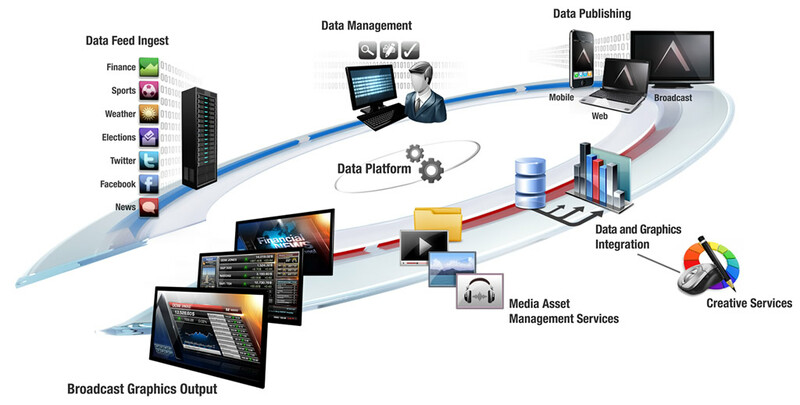 Centralized web-based interface to preview, moderate and configure all of the incoming data feeds. Preview stock charts, approve & monitor social media feeds. Programmable HTTP REST API to extract, transform or process data. Use data from the Request Engine and send it in different formats, push to FTP sites, network files, connect directly to render engines, and more. Powerful sets of VizRT plugins that automatically build the scene and link the live data to the graphics. Yes, automatically. Plugins are available for all our data modules and provide a fast, easy way to use live data in Viz Artist. The Astucemedia Data Platform supports the Viz FeedLinker feature that provide producers and template editors with a graphical way to browse and select data content. Viz FeedLinker uses the Data Platform’s ATOM format to display a visual browser to select items. PUSH data live directly to Viz Engines with YAML for Update Hub compatibility. On-Air graphics engines can connect to the Data Platform directly by using the non-proprietary HTTP REST API. Data can be returned in many formats that best suit the engine’s scripting capabilities. Data can be sent as JSON, XML, YAML, ATOM, RSS, CSV and Viz Data Format, either as an HTTP Response or written to file. Keep your second-screen data in sync with the Data Platform. The Data Platform’s publishing engine can send data to multiple target destinations, including the on-air graphics and simultaneously push to network files or ftp sites. This ensures that all of your “screens” are displaying the same data. An open non-proprietary format means that developers can extend the core functionality of the Data Platform to customize and tailor the system to their specific needs. Devs can create their own requests and control how the data is fetched from the databases and massage the format of the output.